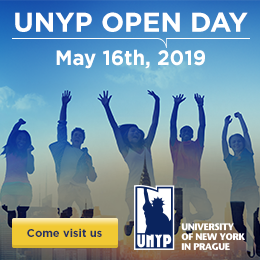 1) The organizer of the contest is the University of New York in Prague, s.r.o., which is headquartered at Londýnská 506/41, Vinohrady, 120 00 Prague 2, and registered in the Commercial Register maintained by the Municipal Court of Prague, Section C, in File No. 60,332 (henceforth known as the “Organizer”). 1) The contest will last from August 30th, 2016 to October 16th, 2016. 2) The contest is open to website visitors who are 15 or older for the duration of the contest and reside in the Czech Republic. Employees of University of New York in Prague are not eligible to enter the contest. 3) To enter the contest, the contestant must find 5 drawings of Justin Bieber’s head which are randomly displayed on the University of New York in Prague’s website (www.unyp.cz) and answer correctly 5 multiple-choice questions. Question appears after clicking on the drawing. 4) Each contestant can participate in the competition only once. Anybody who enters the contest more than once (unless it is stated otherwise) will be disqualified from the competition. 5) Submission of an entry to the contest will be considered a binding agreement to the terms and conditions of the competition as presented in this document. 1) Winner will be chosen randomly by drawing from all the contest entries. 2) Winners will be announced on November 1st, 2016. The announcement will be posted in the news section of the website (www.unyp.cz/news) and winner will be contacted via e-mail. 3) If the contestant doesn’t claim victory within 14 calendar days, the prize will be forfeited to the organizer. 1) The winning contestant will be advised regarding how to claim their prize by email. 2) Prizes cannot be exchanged for cash or switched for prizes other than those determined by the competition organizer. 3) Winners have no legal claim to the prizes which could be enforced by law. 4) The prize for the competition is two tickets (standing sector) for Justin Bieber’s show in Prague, on November 12th. 5) Any and all tax liability is the responsibility of the winner. 1) In the case of a reasonable suspicion of fraud, abuse and/or mistakes relating to the process of the contest, the organizer reserves the right to close or suspend the competition, modify these conditions, announce that the declared winner is no longer considered valid, or without notice or compensation, block participation in the contest by those who don’t enter the competition in good faith. 2) The organizer is not responsible for the fact that participants enter an incorrect address, phone number or email. The organizer also isn’t responsible for other reasons why the participant didn’t receive their prize if these reasons are not the fault of the organizer. 3) If the organizers have a reasonable suspicion of fraudulent, dishonest or unfair actions on behalf of a participant or other people who helped the participant win, or if such conduct occurs, then the participant will be disqualified from the competition; this will also apply to other people who helped the participant win in a manner that is contrary to the competition rules or not in good faith. 4) Participation in the competition cannot be enforced by law. 5) The contest organizer reserves the right to change the parameters of the competition even while it is underway without notice. 1) By participating in the contest, every participant confirms their agreement with the competition rules and that the organizer is entitled, in accordance with § 87, 88 and 89 of the Act no. 89/2012 Coll., of the current Civil Code (henceforth “The Civil Code”) to use the participant’s name, surname and city in the media (as well as the internet), and the promotional and advertising materials of the organizer in association with the contest in addition to the information being taken and published as described above in audio and video recordings for a period of 5 years following the contest. 2) In accordance with the Act no. 101/2000 Coll., in the Law on Protection of Personal Data, as amended (henceforth the "Act on Protection of Personal Data"), each contestant grants the organizer consent to the inclusion their personal data and information shared by the participant with the organizer during the contest such as their name, surname, permanent address in the Czech Republic and e-mail address (henceforth referred to as “data”), and further in the database of the organizer and its subsequent processing by the organizer for the purpose of evaluating the competition, publishing the results of the competition, for marketing and PR purposes of the organizer, ie. offering products or services, including sending information through electronic means according to Act no. 480/2004 Coll., and in order to prove consent to the processing of personal data for these purposes for an indefinite amount of time as well as the fact that these data can be associated with other data. Contestants acknowledge that according to § 11 and § 21 of the Act on Protection of Personal Data, they have the right to rescind their consent at any time without penalty by contacting the organizer listed in these rules as well as have the right to access their personal information and change the information, block incorrect information, delete the information, etc. 3) The personal data will be administered by the organizer in electronic form. Protection of personal data will be arranged by the organizer. 4) If the participant doubts the adherence to the rules of the organizer, they have the right to contact the Office for Personal Data Protection, headquartered at Pplk. Sochora 27, Prague 7, PSČ 170 00. 5) The contest isn’t sponsored by, administered by or affiliated with Justin Bieber. 6) The contest isn’t sponsored by, administered by or affiliated with the Facebook or any other social network in any way.